In my previous post, I took a look at examples of greenwashing that are making the benefits of purchasing “sustainable” beef hard to achieve for producers and buyers. How much of a difference can you make by “voting” for sustainability through your beef purchasing choices? To answer this question, I follow a science-based green purchasing framework. The first steps are to identify (1) the environmental and other (e.g., health, economic) impacts of poorly-managed operations, and (2) the solutions to each impact. In the beef lifecycle, cattle spend the first half to two thirds of their lives on small ranches and farms (cow-calf and stocker/backgrounder operations). When poorly managed, these grazing operations can cause extensive pollution, land degradation and species endangerment, and generate considerable climate-disrupting emissions. The good news is that well-managed rangelands (grazed natural ecosystems, mostly in the western U.S.) and pastures (farmland planted with grasses to graze livestock, mostly in the eastern U.S.) provide valuable ecosystem services to society. By purchasing “sustainable” beef, buyers can avoid contributing to consequences of poor management, and can support benefits provided by well-managed operations, on a massive extent of American lands. U.S. livestock (mostly beef cattle) graze over 780 million acres—an area six times the size of Texas. Below I summarize top environmental impacts of poor ranch management, and benefits of good management. Top forms of climate-disrupting pollution emitted by grazing operations include enteric methane (mostly from cattle burps), nitrous oxide (from manure deposited on pasture), and carbon dioxide (CO2, from losses of soil carbon to the atmosphere through erosion). Poor management also makes ranches more vulnerable to drought. When it is too dry to grow enough grass, ranchers have to feed cattle hay ("supplemental feed"). Scientists estimate that the climate crisis could increase supplemental feed costs by up to $235 million per year for California ranchers alone. These economic impacts will be most severe on poorly managed ranches with degraded soils and forage. Benefits of Well-Managed Ranching: A variety of grazing, feed and breed management practices reduce heat-trapping emissions of grazing operations. 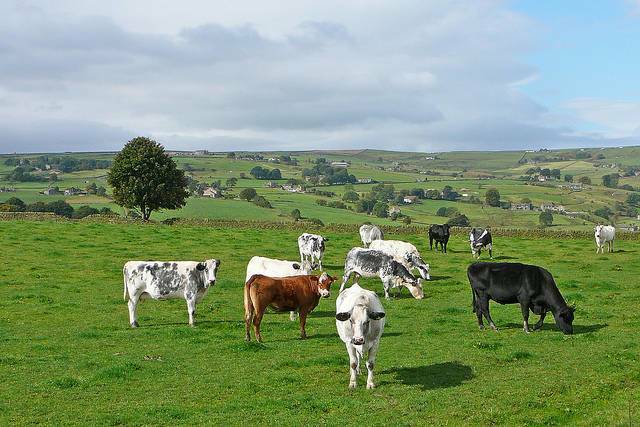 For example, well-managed grazing can increase the amount of carbon stored in the soil, and reduce emissions of heat-trapping methane, nitrous oxide, and CO2. On eastern pasturelands than in western rangelands (wetter climates support more plant growth). As noted in my previous post, scientific consensus currently views carbon sequestration as an important “stabilization wedge” to advance, not as the “silver bullet” that some claim. Since climate-smart ranching strategies focus on improving production efficiencies, management quality, and resilience to extreme weather, they offer economic opportunities to producers and mitigate risks. Impacts of Poor Management: According to a Cornell University study, one hectare of overgrazed pasture can lose more than 100 tons of soil to erosion per year, more than 16 times that of well-managed pasturelands. The authors estimated that 54 percent of U.S. pastureland is being overgrazed. Benefits of Well-Managed Ranching: Good stewardship of soil health is the foundation of successful ranching. Well-managed grazing minimizes erosion, evenly distributes manure nutrients, and maintains soil fertility and forage productivity. Since healthy soils absorb more rainfall, slow runoff, and store more water, additional benefits include reduced sediment pollution of waterways and increased drought resilience. Optimizing soil health also cuts fertilizer costs and pollution-related risks. Impacts of Poor Management: Top polluters of rivers and streams assessed by the U.S. EPA include "grazing in riparian zone or shoreline zones" (37,265 miles), "livestock (grazing or feeding operations)" (31,158 miles), "rangeland grazing" (17,974 miles), and "animal feeding operations" (13,480 miles). Where this pollution includes dangerous pathogens such as E. coli, Leptospira, Cryptosporidium, and Giardia, it threatens the health of families swimming downstream. Pathogen loads increase in grazed watersheds when livestock deposit dung into streams, and when dung runs off into waterways. Benefits of Well-Managed Ranching: Healthy vegetation cleanses runoff by trapping sediment, nutrient, and pathogen pollution before it reaches waterways. Well-managed ranches precisely apply nutrients and pesticides in ways that prevent runoff into surface and groundwaters. As a result, water leaving ranches and entering waterways is clean, maintaining healthy fish populations and minimizing environmental, health and business risks posed by water pollution. Impacts of Poor-Management: Inefficient water use, still too common on America’s ranches and farms, depletes waterways and aquifers. In California alone, the nearly 1 million acres of irrigated pasture require as much water as a city the size of Shanghai. Benefits of Well-Managed Ranching: Well-managed ranches efficiently deliver water to animals, preventing freshwater depletion and using the minimum quantity of water necessary for production. Good grazing management enables ranches to get more out of every raindrop by slowing runoff, so that more rainwater is absorbed into the soil instead of running off into waterways. Healthy soils absorb water like a sponge, keeping more in the system to support productive grasses and livestock—and native plants and wildlife. Optimizing water use efficiency reduces costs of both water fees and energy for irrigation pumping. Impacts of Poor Management: Scientists estimate that poor grazing management contributes to the decline of 22 percent of threatened and endangered species, nearly as many as logging (12 percent) and mining (11 percent) combined. Much of this has to do with habitat degradation. In the American West, for example, livestock grazing occurs on about 250 million acres of federal public lands, many of which are in arid regions particularly vulnerable to impacts of poor grazing management (see also this classic article). Public Employees for Environmental Responsibility reported that almost 40% of Bureau of Land Management grazing allotments surveyed since 1998 (over 33 million acres) are impaired, with poorly-managed grazing the primary cause of lands not meeting rangeland health standards. Benefits of Well-Managed Ranching: Well-managed ranches contribute to conservation in the landscape by maintaining habitats and conserving America’s natural heritage of native plants and wildlife. They take proactive steps to minimize conflicts with wildlife, and partner with agencies, scientists, NGO’s and neighbors to protect and restore sensitive species. Predator-friendly practices such as moving calving dates from winter to spring cut supplemental feed costs, since spring-born calves have fresh grass to graze. Partnerships such as New Mexico’s Quivira Coalition and Nevada’s Results-Based Grazing Group are restoring fish and wildlife habitats on public and private lands. Others like the Western Landowners Alliance, Malpais Borderlands Group, Blackfoot Challenge, and California Rangeland Conservation Coalition are also engaged in conservation, generating environmental and economic benefits. Given the vast differences between well-managed and poorly-managed grazing operations, your beef purchasing choices can help conserve a massive extent of land. To maximize benefits, first identify key impacts, which vary by region and operation type – e.g., between western rangelands and irrigated and eastern pastures. Next, develop purchasing guidelines comprehensive enough to recognize sources that achieve as many positive outcomes as possible. Make sure there are no critical gaps that could land your brand in hot water, and aim for step-by-step improvement – sustainability is a journey. Some ask, “what better management practices (BMPs) should I look for?” Most producers respond with some version of, “Tell us what results you want to see and let us figure out the right practices to use to achieve them, given our location and management style.” There’s a menu of science-based, practitioner-tested BMPs that ranchers can choose from to achieve positive outcomes. How can producers and brands prove that they have minimized the impacts and realized the benefits described above? After repeating this exercise for beef feedlots, I’ll explore certifications and eco-labels in the sector. Jonathan L. Gelbard, Ph.D. is Principal and Senior Conservation Scientist at Conservation Value Solutions. As a researcher, writer, speaker, and advisor, he digs deep to identify root causes of problems, and catalyzes transformative solutions. Dr. Gelbard was Senior Scientist at the Grasslands Alliance, a partnership between NGO’s, certifiers and ranchers that developed and piloted a comprehensive certification standard for U.S. and Canadian beef cattle and bison grazing operations. The Grasslands Alliance is currently fundraising to support its development of certification and continuous improvement programs. Click here to learn more.